Jan Marini Bioglycolic Eye Cream - To touch or not to touch...that is the question. The skin beneath our eyes if so very delicate. We can have dark circles, bags, and wrinkles in this area of our skin. We slather on cover up, eye cream, and makeup remover to the eye area. We need to touch it carefully and treat it often. 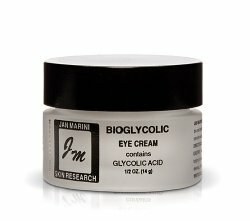 The Jan Marini Bioglycolic Eye Cream puts moisture back into the eye area. It imitates the skins water binding properties thus attracting water and moisture under the eyes. It also soothes the under eye area with the active ingredient Chamomile. Those with Aging skin and those with dry skin. Apply to orbital bone twice a day. Deionized Water, Glycolic Acid And Ammonium Glycolate, C12-C18 Alkyl Benzoate, Cetyl Ricinolate, Glyceryl Stearate And Peg-100 Stearate, Aloe Vera Gel, Sodium Hyaluronate, Rosemary Extract, Chamomile Extracts, Methylsilanol Theophyllinacetate Algimate, Methylsilamol Mamnuromate, Lecithin, Xanthangum, Methylparaben, Propylparaben. "My eye area is slightly more firm that it was before." "I can only use it 3 times a week otherwise it will puff up my eye area." "I did not see a huge difference in my under eye area. I was a little disappointed." "I do love this product and will continue to keep it as my eye cream."